Our Trampoline Enclosure Systems are designed to ensure a more enjoyable jumping experience while also providing additional safety to jumpers. Our universal design fits most 12ft round trampoline models from major manufacturers. Our enclosure system features an easy-to-operate zipper entry and included safety clips to prevent unsupervised access by small children. The enclosure net securely attaches to the mat without including the springs within the enclosed jumping area. This provides a significantly safer jumping experience! UV inhibited premium mesh net extends the durability and life of your enclosure system. Constructed with galvanized steel and foam protective casing. This Enclosure System will fit MOST 12 Ft. Round Trampoline models from major manufacturers so long as the diameter of the trampoline legs are less than or equal to 1.5 inches. Printed Instructions are included. Order includes Trampoline Net, 6 Poles, Attachment Hardware, Foam Sleeves, and Rope. Will fit most 12 Ft. Round Trampoline models from major manufacturers so long as the diameter of the trampoline legs are less than 1.5 inches. Order includes Trampoline Net, 6 Poles, Attachment Hardware, Foam Sleeves, and Rope. The enclosure net securely attaches to the mat without including the springs within the enclosed jumping area. This provides a significantly safer jumping experience! 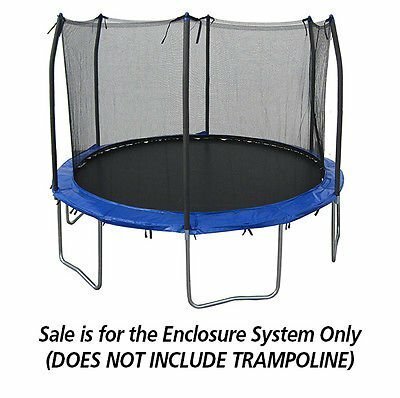 If you have any questions about this product by Trampoline Pro, contact us by completing and submitting the form below. If you are looking for a specif part number, please include it with your message.